Thanks to the calendar, for the first time in 7 years, I was able to partake in the Greater Portland Christmas Bird Count on Sunday. Normally a Saturday event – not something someone in retail can pull off in the last weeks before Christmas! – this year the count was held on the first day of the count period. I covered my old CBC – and usual outside of the CBC – stomping grounds of the Portland peninsula, joined for half of my day by Luke Seitz. As usual, the scrubby thickets, warm microclimates, and patches of fruit in the big city did not disappoint. Phone-binned photo by Luke Seitz. …followed closely by a total of 6 Hermit Thrushes. The previous circle-wide high count was 5! 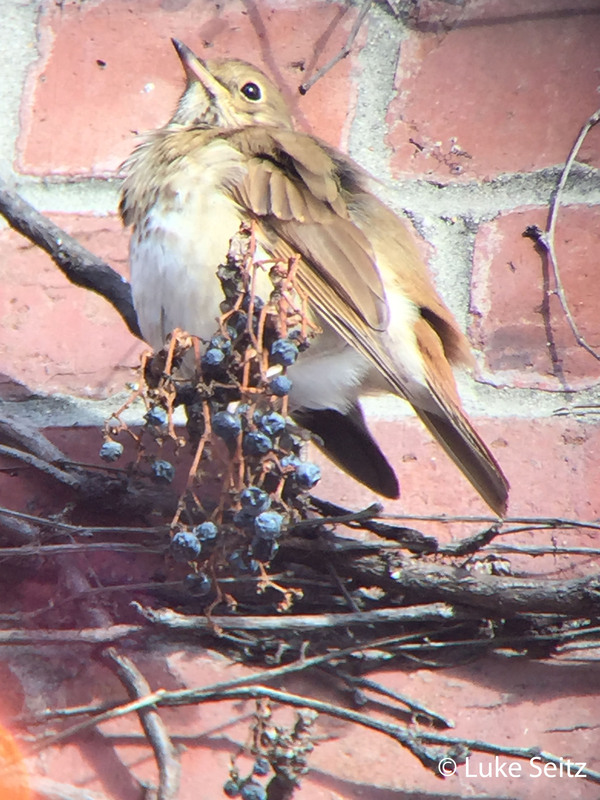 This bird feasted on Virginia Creeper climbing up a brick wall along Free St.
Two Swamp Sparrows (1 along the Eastern Promenade and 1 at Mercy Pond) were noteworthy, as were our tallies of 44 Northern Cardinals and 26 Northern Mockingbirds in particular, for a total of 42 species. 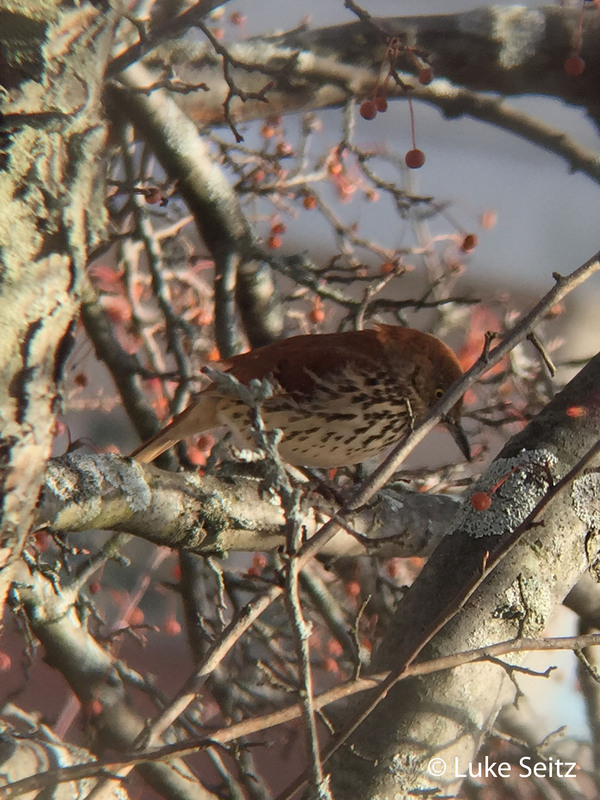 Portland was birdier than usual for mid-December, likely due to an abundance of fruit (especially crabapples) and overall relatively mild temperatures this fall, allowing things like thrushes to stick around/survive in the area. Today, Kristen Lindquist and I covered the Moody (Wells-Ogunquit) area for the Southern York County CBC – my usual, exceptionally productive, territory for this count. Again, it was a very birdy day, but unlike Portland, the birding was a little more challenging. 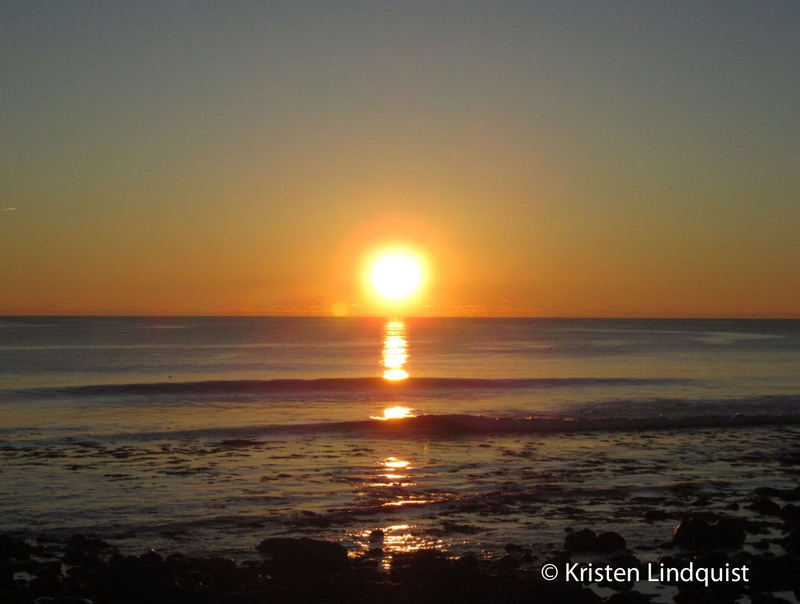 The lack of snow cover and limited ice in the marsh reduce concentrations of birds, and the mild temperatures minimized concentrations at sunny edges. There was a lot of food to be found, so birds weren’t packed together at feeders or dense thickets in warm microclimates. Nonetheless, we tallied 59 species (below average for this section), and several “good” birds. The best of which was an Eastern Meadowlark in the saltmarsh off of Furbish Rd, a 5th count record. A Common Yellowthroat (10th count record) was in a cattail marsh at Moody Point where I have had yellowthroats on this count more often than not. 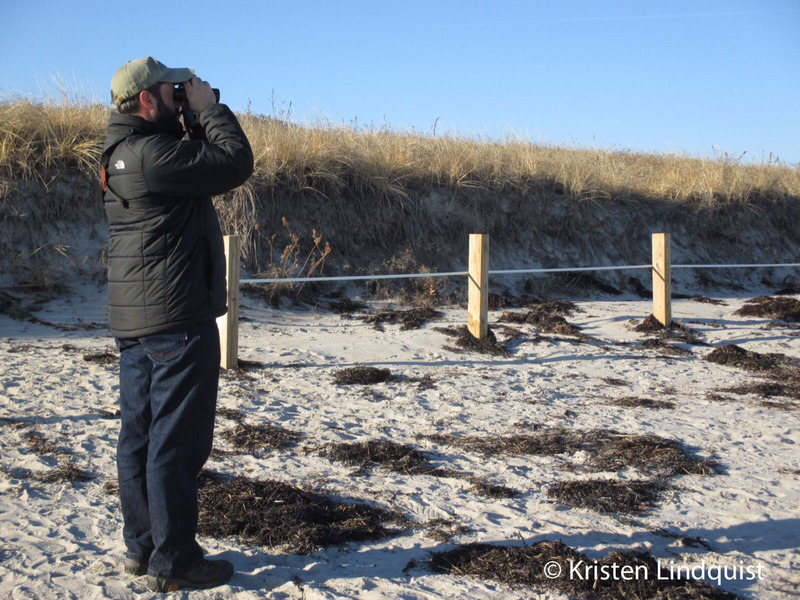 8 Dunlin among a goodly 188 Sanderling on Ogunquit Beach were a 7th count record, and other good birds included a Hermit Thrush, 5 American Pipits (Eldridge Rd), a male and female Northern Pintail, and two Harlequin Ducks at our dawn seawatch at Moody Point. Five Black-legged Kittiwakes off Moody Point and 3 Razorbills off of Ogunquit Beach were expected, but always nice to see. End: 37F (high of 42), clear, very light Var. My next CBC will be Freeport-Brunswick on January 3rd. Until then, Merry Christmas-counting everyone! This entry was posted in Birding in Maine and tagged "Birds, Birding, Brown Thrasher, Christmas Bird Counts, Hermit Thrush, Portland, Southern York County on December 15, 2014 by Derek.